Metal-ceramic artificial teeth are relatively low-cost items that take little time to make, so they are the most widely used tooth replacements. Even though the ceramic material of the crown can be coloured arbitrarily, the opacity of natural teeth cannot be achieved. The metallic frame of the artificial tooth, which ensures mechanical rigidity, is prepared by a dental technician based on an impression of the neighbouring teeth (once those have been chiselled). Then an appropriately coloured ceramic crown is burned onto the frame. The frame is made of an alloy of cobalt and chromium, gold and platinum, or silver and palladium, or of unalloyed gold or titanium. Tooth frames made of nickel and beryllium alloys should be avoided because they may cause allergic reactions. Metal-ceramic dentures made with an outdated technology called tangential chiselling cause a number of problems. The method involves chiselling the tooth under the gum, too, in order to ensure that the edge of the crown goes under the gum (so as to hide the grey colour of the metal frame). The edge of the crown irritates the gum, which gradually retracts. This process can lead to gingivitis, and the frame becomes rather conspicuously visible over time. 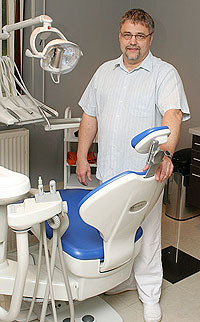 These problems can be prevented by the so-called “shouldered” preparation method, which protects the gum because the tooth frame “rests” on a shoulder. Gapless connection between the tooth and the metal-ceramic crown allows for perfect cleaning, increases the life-span of the tooth, and looks much more attractive as the metal frame remains hidden over time.